Military backpack is made of high density fabric--durable and water-resistant. 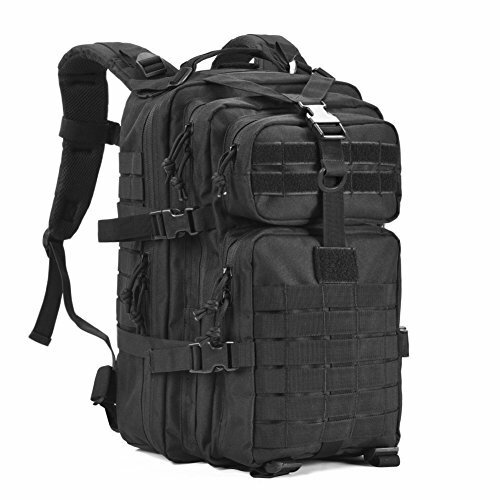 Tactical backpack has molle system, MOLLE is a little different as most tactical molle bacpkacks and is not to spec. Spacing between of molle is less than 1/2"
Tactical assault backpack Capacity: 34L. Size approx. :11"*18"*12" (W*H*D), it's not big backpack; Military backpack is made of high density fabric--durable and water-resistant. Tactical backpack has hydration compatible that works great for a 2.5L hydration bladder (backpack didn't include hydration bladder) as hydration backpack or outdoor camping hiking backpack. Tactical assault pack backpack's waist straps and chest straps are removable as heavy duty work or school backpack, please check straps before you use it in order to avoid straps fell off and lost. If you have any questions about this product by GOWARA GEAR, contact us by completing and submitting the form below. If you are looking for a specif part number, please include it with your message.